This audio book version of Dead Spy Running will be available on 1 June, nearly a month before the print version. Quite a coup for Whole Story Audio Books and a noteworthy event. Like Stephen Fry, I am a big fan of audio books and leapt at the chance to have a review copy and I wasn't disappointed with the result. Dead Spy Running is the first of a trilogy and the central character is MI6 agent Daniel Marchant. Daniel's father, a former head of MI6, was forced out of his job under a cloud of suspicion and died shortly afterwards. Daniel has been suspended pending an investigation into his father's activities to see if he was indeed a traitor. Daniel wants nothing more than to clear his father's name. The book starts with Daniel and his fellow agent/girlfriend entering the London Marathon where Marchant's professional instincts kick in and he spots a fellow runner wearing a belt that could contain explosives. The runner soon confirms that he must run above a certain speed or the bomb will detonate. When Daniel saves the day, he expects to be treated rather more as a hero than a suspect. And yet the Americans want to 'debrief' him, treating him as hostile. Daniel's boss, Fielding, aka "the Vicar" agrees to release Daniel to the CIA so long as he is returned alive and does not leave British soil. Daniel's globe-trotting is about to begin, with the CIA ignoring Fielding's order and taking him on a rendition flight to Poland. Poland is soon followed by an MI6 assisted flight to India and Daniel begins to close in on the truth as to what his father's unexplained actions were all about, whilst all the while trying to avoid re-capture by the Americans and ultimately preventing one of the most shocking terrorist attacks of all time. 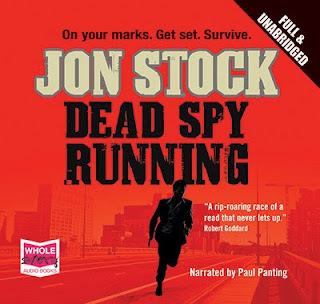 Dead Spy Running is 'edge of the seat' listening; from the very possible sounding Marathon scenario at the beginning of the book to the tense final set piece in India, the pace doesn't sag and includes a (rather too) memorable water torture scene along the way. The Indian setting was particularly well evoked. What I especially enjoyed was all the inside information about the relationships between MI5, MI6, CIA and also about what goes on in the MI6 building (aka Legoland), both the business side and the other snippets such as - does the MI6 boss actually have a butler? Dead Spy Running is well written and just flows along. I was absolutely hooked and would have gone straight onto the next book, were it available. If you've enjoyed Stella Rimington's Liz Carlyle series then you'll love Dead Spy Running. Narrator Paul Panting gives a marvellous performance, especially his world-weary Daniel, as well as whole host of other different accents and voices. You can listen to a ten minute extract on the Whole Story Audio Books page. Absolutely agree with this review. I started listening to it yesterday evening and finished it this morning, with about two hours reluctant sleep in between, which lent the last few hours of it an appropriate hallucinatory quality! I know nothing of Jon Stock's background but he has the born thriller-writer's eye for detail and effortlessly evokes cities as disparate as Warsaw and Delhi. His portrait of the assorted spies and their ferocious feuding may be complete invention for all I know, but it's absolutely convincing while you're reading (hearing) the book. The narrative drive never falters, even though there is a lot of back-story that has to be revealed along the way. The water-boarding sequence is frighteningly vivid; I would be very uncomfortable if I were an American reading this (as a Briton it leaves me less happy than ever that my government was complicit in rendition).